I had the pleasure to contribute content for this app. You’ll find many of my loops, midi files, and a remix called Power by Jah Boogie. – Riser synth for creating risers using noise and tones with filtering and modulation. Version 1.1 of meta.dj update adds a split cueing mode for headphone cueing, EQ, and support for the Numark iDJ Live PLUS bulk import of multiple iTunes tracks. Track Deck allows you to load MP3s from your iTunes collection and mix them, beat match them, and completely mangle them with the multi effects processor. TrackDeck includes auto BPM detection, four programmable cue points, x/y effects pad, scrolling waveforms, cross faders, an line fader. Features a free song from Jah Boogie called Power Dj Puzzle‘s Club mix and Dj Puzzle loops. Music provided by Desha Music Inc.
Looptastic allows you to combine a huge selection of included loops with your own beats to make a masterpiece. Bend the mix into submission with powerful sound manipulation tools. Share your mixes and performances with the world via SoundCloud! 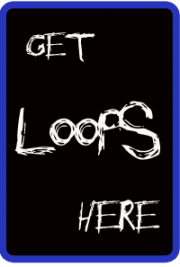 Import your own loops or download loop packs from the in app store. Looptastic automatically syncs up to all of the apps loaded within the meta.DJ app’s cells. SaMPL3R (aka Grüvtron) is an arpeggiator synth/sampler. Choose a Preset and grüvtron selects the right sequences and instrument sounds to create the foundation for your own new instrument parts. It’s the Smart Instrument for Electronic Musicians, DJs and Dance Producers. Grüvtron comes preloaded with performances and sounds created for Techno, Trance, Dubstep and other electronic styles. Gruvtron automatically syncs up to all of the apps loaded within the meta.DJ app’s cells. Drumtron is a drum sequencer that comes with preset drum patterns that can be customized and synced up to all of the apps loaded within the meta.DJ app’s cells. Are you ½ producer and ½ DJ? Has your style outgrown the abilities of 2 virtual decks, digital wax and a mixer? meta.DJ is targeted at modern DJ-style performances and lets you blend your iTunes music tracks with drum machine beats, sound fx, synthesized instrument parts, mix effects like delays, stutters, filters and more! Each iTunes track can get it’s own reusable Cue and Loop presets, to let you work the track to the fullest. All from an easy-to-use touch interface! QUAD DEVICE SUPPORT – TRACKS, LOOPS, INSTRUMENTS AND MORE! Use of up to 4 virtual devices at any one time. Use any combination of devices during your set including Track Decks (for iTunes tracks) plus Looptastic, SaMPL3R and drumtron instruments based on Sound Trends grüvtron technology. Load your track into a Track Deck and breath new life into your library. Easily import tracks from your iTunes library. Automatic tempo detection plus x2, /2 and Beat Grid adjustment tools let you nail down those tricky tracks. Use the waveform display to help gets things just right. Playback automatically plays back on the beat. Use for creating Loop Presets or to quickly throw in 1/2/4/8/16/32 bar loops as you play the tracks during your Live Set! 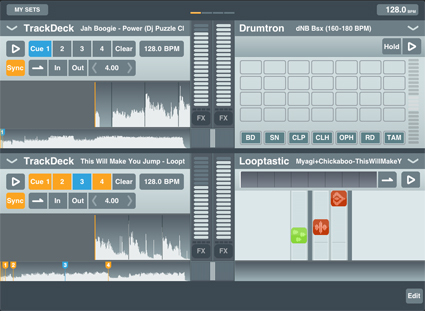 The loop-based remix instrument for playing, mixing and adding effects to audio loops. Every loop’s a fader! • Scratch Strip for scratching and interactive control of loop playback. • Metadata support for key, BPM, genre and instrument part. A new take on the drum machine. Mix together Kick, Snare, HiHat and other parts to build the mix how you feel it. You get FIVE pounding kits loaded with parts. All done without using audio loops so the sound stays tight with a cool pitch control for some freaky FX! Based on grüvtron, SaMPL3R lets you easily add instrument parts (arpeggios, chord stabs, basses, leads, etc) to the mix in any key and morph them together. Plus a Control Strip lets you add filter and modulation to the sound. Key Mode can help you find the key of your tracks, and/or play the sound live. Each device has it’s own mixer fader and can have up to FOUR (4) FX assigned at once. FX include Low/High Pass Filter, Gate, Stutter Loop, Stutter Stepped, Stutter gate, Bitcrusher, Flanger, Glitchy Repeater, Delay, Reverb, Pan, Compressor and Pump. All are controlled by an XY pad with “Hold” feature for setting an FX setting like a preset. Create dramatic rise and fall effects with noise and pitch with filters and modulation. All using simple XY controls! Import a group of WAV files and trigger them via on screen pads during your set. Each Set Document includes user-defined combinations of Devices with a collection of Snaps. Each Device Snap includes the content in the Device (music tracks w-Cues/Loops, Instruments Presets, audio loops, etc.) and mix information (effects, volume level),stored as easily recalled snapshots.